The solution is quite simple to use the timestamp of a particular Windows file or folder / directory! 1.) ... File timestamp from file. 2.) ... File timestamp from already used timestamp changes! 1.) File timestamp from file. From the version 3.04, you can now do it by right-clicking on the appropriate file or directory. ◇ Additional info: equate file timestamp. Please ► ... use always the latest version of NewFileTime! 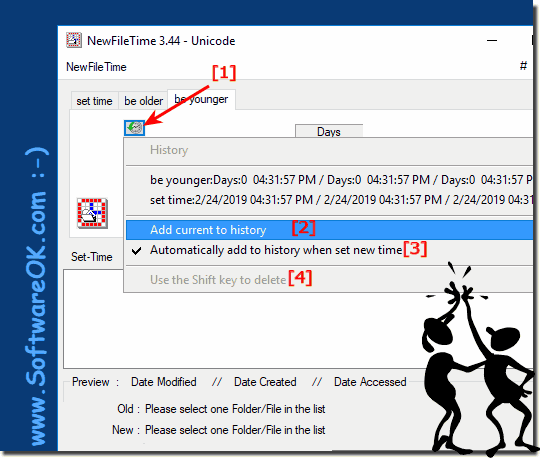 (Image-1) timestamps from a specific windows file or folder! Please ... use The latest version of NewFileTime for Windows ! More change information can also be found in: the ► version overview ! As you can see above in Windows 10 shot screenshot, you can use timestamps from a certain Windows file, or folder, you can use this file timestamp example as a solution without hesitation also on earlier versions of MS Windows operating systems. Regarding file timestamps, it does not matter if it's a Windows desktop, mobile tablet, Surface Pro / Go, or even an MS Server operating system. 2.) File timestamp from already used timestamp changes! From Ver. 3.44 to improve the user-friendliness you can use the history function. This is automatically saved when a new file time is set, thus saving a lot of time. Hint: menu selection and pressed shift key deletes the marked history! Info: Stores up to 16 last entries! (Image-2) Timestamps from a specific History Time! Use timestamp change from history! Thanks for providing this nice prog. May I suggest another really-nice-to-have feature? What about a keeping the last (changed) time and date when finishing the program -- best with an extra button: "Apply last used time/date"? This would increase usability a lot! 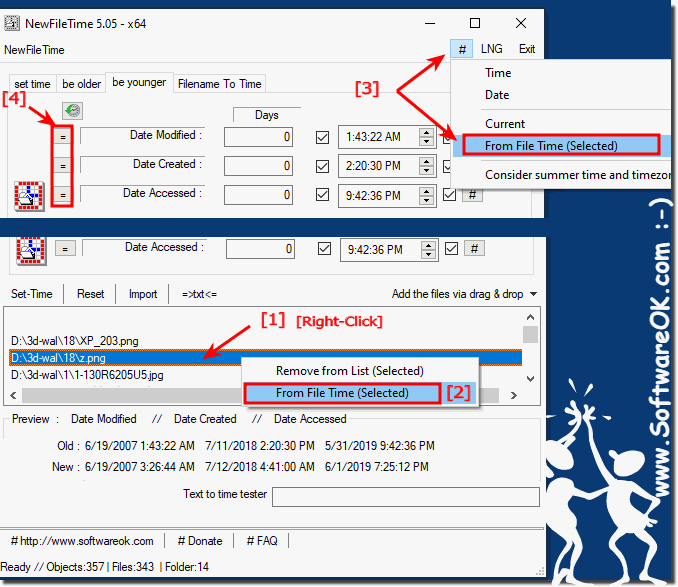 NewFileTime - FAQ-8: Use timestamps from a specific windows file or folder! When I create a folder to copy a stick, Windows automatically sets the current timestamp what is wrong, the cut and sifting helps me not synonymous, because I want to have the files on the hard drive AND on the USB stick, both with the correct Create date and other file times.